Visiting people who can’t get to church for various reasons – either for short periods of time or permanently. Holding fundraisers for organizations that we believe care for the poor, the marginalized, the oppressed, and the stranger. 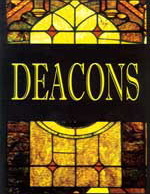 If you, or anyone you know, would like a visit or phone call from one of our deacons, call or email the church office. Like the pastor, the deacons are bound by the rules of confidentiality. Anything shared with any deacon will remain with that deacon unless they believe someone is in imminent danger.